세상을 바꾼 14가지 광고 - 5. Give Yourself A Coffee Break! 1950년대 중반, Pan-American Coffee Bureau라는 커파회사는 직원들이 오후에 긴장을 풀고 잠시 쉴 수 있는 시간을 장려하기 위해 "Give yourself a coffee break - and get what coffee gives to you"라는 광고 캠페인을 시작했고, 이는 엄청난 유행을 타게 되었다. 음식 블로거 Erin Meister는 "광고 카피 자체가 다소 어색했음에도 불구하고, 커피 브레이크라는 개념 자체는 빠르게 퍼지기 시작했습니다. 머지 않아 아침과 점심 시간의 커피 휴식도 일상화되기 시작했으며, 심지어 법으로 보장되는 경우도 생겼습니다." 라고 언급했다. 휴식시간이라는 개념은 그 자체가 사람들이 협상의 수단으로까지 사용하게 되었다. 1964년에 미국 자동차 노동자 노조는 커피 브레이크를 계약서상에 명시하지 않으면 파업에 돌입하겠다고 사측을 협박하기도했다. 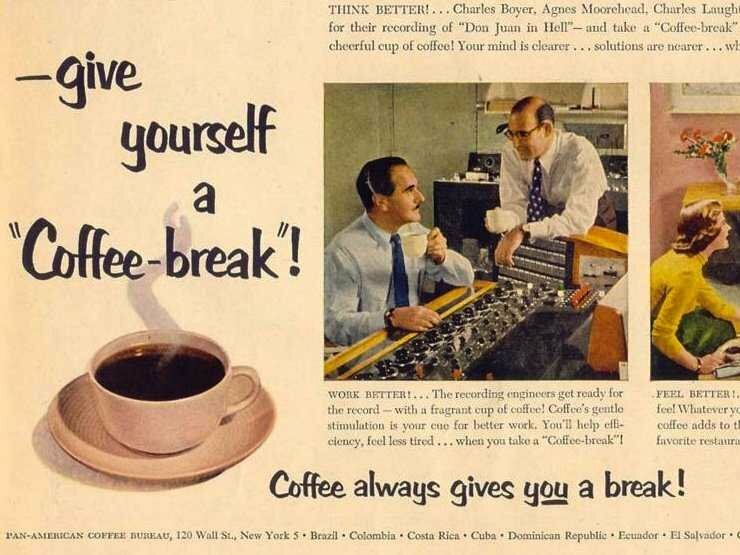 The break became something people bargained for: In 1964, the United Auto Workers Union threatened to go on strike unless the coffee break was written into their contract. Bonus fact: Swedes call it fika.